Editing multiple employee profiles with the same details in one go. Sometimes you may need to edit or quick action a group or all of your employee profiles at once. You can do this in the employee tab in Bizimply. Click on the empty box to the left of 'Name', this will select all employees. Select the Actions button and chose what you would like to do with the selected employees. Please note that the Action button will not appear until employees have been selected. You will be given five different options. Quick Edit - Here you can quick edit different sections of the employee profile. Including Personal, Work and Payroll details. Send Email Message - By selecting this option, you will be able to send a mass message to all employees selected. Email PIN - You will use this when you first start using Bizimply. By selecting this option, you will email the employees selected their PINs, which they will use to punch in and out on the Timestation app. Export as CSV - By selecting this option, a CSV will be exported and downloaded onto your computer. This CSV will contain all information from the employee profiles of the staff members selected. Deactivate Employee - Here you can deactivate employee(s) selected from the system (Don't worry, you can always reactivate them if needs be and their historical work information is always stored in the system). 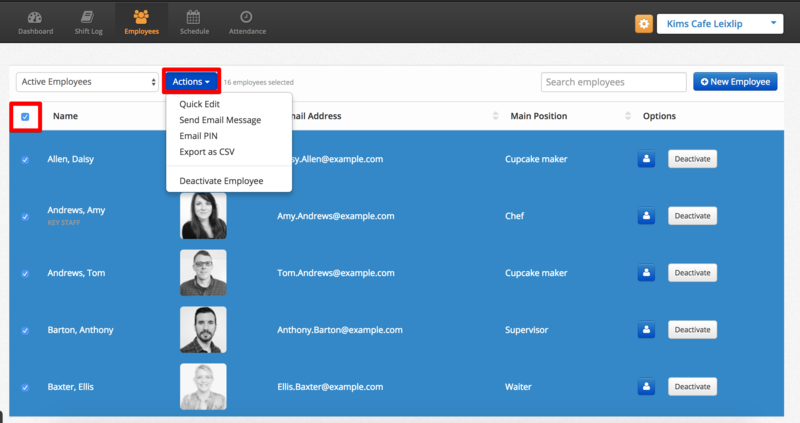 It gives you the ability to edit information for multiple employee profiles rather than one at a time. It gives you the ability to send a message to multiple staff at once.